When I uncheck it, it doesn't seem that I can do anything with the iPad, because touching a main menu item does nothing. With it checked, the main menu item is executed, but there's no way to get to a submenu item. Absolutely love this plugin and have used it for a long time. Thanks. Just updated to WP3.5 and the plugin broke. The images are not showing up properly. Checked in on many hosts and many browsers. All the same problem. Ozh – Was using 3.6.3. Just saw the update notification this morning. 3.6.4 did the trick. Thanks for a great plugin and great support. On WP 3.5 multi-site with Admin Drop Down menu ver 3.6.4 activated on the main site, the images on the network admin are broken links for the menu items Dashboard through Updates. On site admin, all images display fine. If I recall correctly, ver 3.6.3 worked perfectly in this regard, even under WP 3.5. Could it be my setup? I'm getting the same no icons on Network Admin as well. Network activated. Subsites work fine, including the Primary Blog Admin, where I change the menu preferences that apply to the Network Admin screens. Hey Ozh. Thanks for the plugin. Can you make the >> link to the "Visit Site" front-end open in a new window? Minor inconvenience having to leave the dashboard and I always disliked it in the vanilla WP menu. No biggie but great if you can add a _blank or similar element. I understand your reasoning about the target thing, although I would also prefer it. My wish is that the "disable admin bar" option would disable it on the actual web pages, too. I hate that "feature," and the P3 plugin tester says the admin bar disabler plugin adds a lot of time to page load. Duplicating that function would be unnecessary. Wow! I'm evidently not the expert I like to think I am. Thanks! Back when the Admin Bar first came out, there were two checkboxes there; one for frontend, one for backend. When they renamed the Admin Bar to Toolbar and made it persistent, they removed the backend checkbox; because they want everyone to use it and certain plugins add menus to it. Ozh' setting restores the removal functionality but, with the Toolbar disabled, any menus that plugins add to it won't be available. Like this plug-in but have big issue just discovered. When the Ozh plugin is enabled, the "All in one calendar" htt://time.ly does not properly display its events/Calendar feeds" page. Ozh makes the calendar plugin appear to be broken. Hope there is a fix. Same issue as Nesako. Wonder if you could maybe give some possibilities on reverting to wordpress default styling whenever the screen size gets to a certain width. 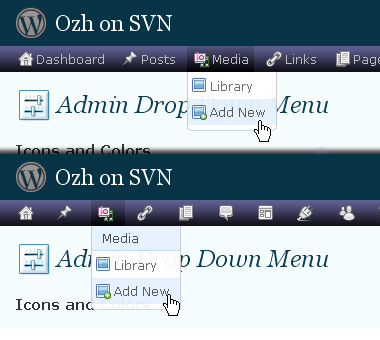 That will put the small icons back to the left of the page and allow for the full responsiveness of the WP Admin area. As it is, the responsiveness is lacking. Looking into the issue myself right now, but writing this just in case you have a quick answer before I start editing anything. what i meant is that img src is broken. page source: img class="wp-menu-image" src="div"
Love this plugin. Such a better use of precious desktop and window area. I have a problem though and the link below is a post of mine from yesterday to the Jetpack forum explaining what might be a conflict between Ozh and Jetpack which creates a 404 error for every page change, edit, publish click, save draft click, etc. etc. I perform within my website. Really would like to keep Ozh, but with the 404 errors I am afraid the NSA is going to pick it up an misconstrue it as some sort of terrorist attack or a threat to national security and shut my website down. :) Anyone familiar with this? Any fixes available for a complete and utter noob? Running both on mine and no issues like you describe, Randall. Thank you for the heads-up guys. Might be corruption somewhere so I'll try a re-install of the plugins. one frustrated "has-had-to-use-wordpress" developer. now i like using it! Great plugin! Is there a way to make the menu bar static? Where it always stays just below the wordpress bar instead of scrolling with everything else? Davit » Indeed, thanks for reporting. I'm pushing a fix. 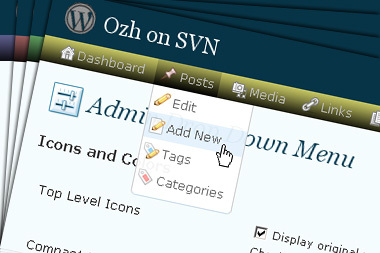 LOVE Ozh drop-down.. hard to live without.. BUT is totally broken by WordPress 3.7.1.. Waaaaah! Agreed. Works here on three separate installs. So, one would gather that something with your install is Borked. so that one can always access the menu without scrolling up to see it. Ice » there's a companion plugin for this. Don't remember the name. It's Admin Menus Fixed. Mentioned and linked to on this page in the last sentence in the Feedback, Bug Report, Feature Request section. First time this old reliable (and great) plugin has caused me any problems. All I do to trigger the crash is install both plugins, do to Events->Venues. Add a couple venues, then to back to the Venue list and click Edit. I get what looks like a white screen of death with only the text message "cannot load venues." Hope that's enough to demonstrate the problem. I'd like to re-activate Ozh. Plugin works great with 1 issue and that is the icons it tries to generate as it rebuilds the menu display as "image not found". When it first starts, it shows just fine, but as it looks for all the menus and re-generates the list is when the icons get lost for some reason. Other wise the plugin works great and it does display the drop down menu and icons. Any ideas as to why this is happening or a fix for it ?? Broken with WP Version 3.9.1. Images are not displaying correctly now. Even Admin Menus Fixed is broken now too. The plug in works for me and I'm using 3.9.1 . The only issue I have is that the icons will not display. If I disable the icons the menu works, but if enable the icons they show up as broken links. I've asked if this can be fixed, but as you can see no support is offered for it any more and that's a shame as this is a nice plugin. It cleans up the admin area for better viewing. The reason that the "icons" don't work is that there are no icons. It's a font. The good news is, there's a fix. Be sure to read the whole thread, as there is an adjustment that I found had to be made to get the font to display correctly. As for Admin Menus Fixed, it works on my 3.9.1 as it should. Tested on every release as it comes out. Nice Menu. I tried to fit my needs. Only one thing I wasen't able to change. the Color of the "default" grey icons. I wanna have them white. I changed the menu, only the icons displayed. is it possible to change the color from the icons? Is it possible to column links to an external url? Love the plugin. Makes your life much easier. Congratulations. I was wondering if there is any chance the menu bar could be sticky to avoid going top to change options. Thanks in advance. Your menu so greatly improves the WordPress admin area that it should be the default admin menu in WordPress. Have you tried donating it to the WordPress Development team, maybe you could join the team if you did, your plug is that good.